Eco-friendly farming (EF) has been practiced in some tea plantations of Wuhe Tableland, Rueisuei Township in eastern Taiwan to maintain populations of the small green leafhopper (SGL), Jacobiasca formosana. Previously considered a pest, this insect is now an economically important asset because tea shoots and young leaves “damaged” by the SGL are now harvested to make a high-priced honey-flavored black tea that is welcomed in the market. However, the socio-economic and ecological impacts of EF have not been examined. In this study, we measured and compared insect (and other arthropod) and vertebrate diversity at three tea plantations with EF practices and three plantations with conventional farming (CF) practices, and interviewed relevant stakeholders to collect information on the socio-economic effects of EF versus CF practices. Our results showed that tea plantations with EF practices not only generate higher economic return but also conserve higher biodiversity. In addition, more job opportunities were created through the EF practices. We conclude that social interviews and stakeholder engagement, as well as biodiversity surveys, are not only useful but also critical tools to identify and verify a socio-ecological production landscape (SEPL) such as the tea production landscape in Wuhe Tableland. Dr. Jung-Tai Chao is a Board member of SWAN (Society for Wildlife and Nature) International, a retired Senior Scientist at the Division of Forest Protection, Taiwan Forestry Research Institute (TFRI) and Curator of Forest Arthropod Collection of Taiwan (FACT) of TFRI. Dr. Chao’s research focuses on ecology and conservation of wildlife, ecology and management of forest insects. He has spent much of his effort on national policy, education and public awareness of biological diversity as well as research on forest arthropod diversity in Taiwan since late 1990s. Dr. Ling-Ling Lee is a Professor at the Institute of Ecology and Evolutionary Biology, College of Life Science, and the Director of Biodiversity Research Center, National Taiwan University. Dr. Lee teaches animal behavior, ecology, mammalogy and conservation biology. Her research focuses on ecology, behavior and conservation of wildlife, especially on mammals, including the Formosan macaque, bats and recently otters. She was the President of SWAN International from 2006 to 2012 and has served as Non-governmental official Member of the National Council of Sustainable Development between 2004 and 2015. Hualien, the largest county of Taiwan in terms of land area, is located in the eastern part of the island. With diverse, natural habitats and a relative low population density (77/km2), Hualien enjoys rich biological diversity. In addition, the late development of Hualien means that culture diversity of many indigenous people such as Ami, Atayal, Bunun, Truku, Sakizaya and Kavalan is well-preserved. Indigenous people make up one-fourth (about 90,000) of the population of Hualien County and the Hakka people comprise about 30% of the total inhabitants. 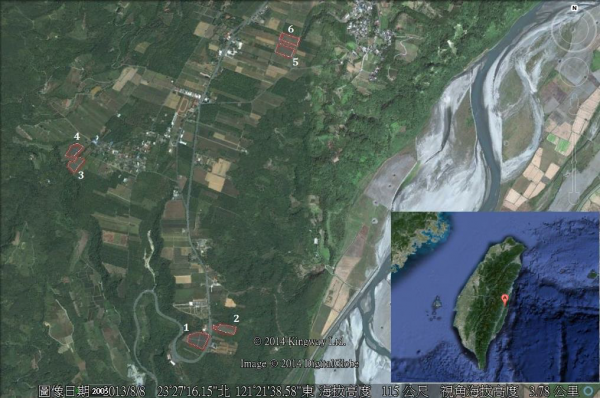 Wuhe tableland is in the southern part of Hualien county near the tropic of cancer monument. This agricultural production landscape which situates at an elevation of 200-250 m consists of farm land, secondary forest, pastoral land, small streams and human settlements. Human activity can be traced back to more than 3000 years ago. Han people began cultivation here in the early 19th century and there is a long history of human intervention. The main crops grow here are fruits and tea. Tea production in Wuhe peaked in 1950-1960 when more than 400,000 kg of tea were harvested from more than 200 ha. of tea plantation. More than 100 households were running tea related business at the time. Farmers used conventional practice to manage tea plantations, which means that they used herbicides to remove weeds and pesticide to control pests such as the small green leafhoppers (SGL), Jacobiasca formosana. Many control methods, including chemical and biological control, have been developed to suppress population of SGLs and protect tea crop from pest damage. Due to the popularity of oolong and other high mountain tea and the increasing supply of much cheaper foreign tea, and degradation of tea plantation, tea industry in Rueisuei became less competitive. Area of tea plantation as well as people running tea related business dropped, young people move away and lack of man power and aging of local population causing further decline of the tea industry. In 2004, County Mayor Hsieh Shen-san launched an IADH (Innocuous Agriculture Development in Hualien) program, which aimed to “pass the good land on to our future generations, increase the per capita income of local farmers and provide a new direction for them by combining agricultural activities with the leisure industry, thus generate even greater revenue.” Farmers have been encouraged to join the IADH program, give up conventional farming practices and take approaches of organic or eco-friendly farming since then. To conserve human-influenced natural environments, or socio-ecological production landscapes (SEPLs), the benefits of biodiversity and human well-being need to be identified and verified. However, social and economic dimensions, particularly the ecological dimensions of many SEPLs, are not measured quantitatively. We found some tea farmers in Wuhe Tableland managed their tea plantations by eco-friendly farming (EF) practices instead of conventional farming (CF) practices, i.e., using herbicides to remove weeds and pesticide to control pests such as the small green leafhopper (SGL). SGL, Jacobiasca formosana, is a common and abundant insect species in tea plantations of Taiwan (Chen et al. 1978, p. 93). With its sucking mouthparts, the insect feeds on phloem sap of the tea foliage, preferably shoots and young leaves. The feeding of SGL retards shoot growth and causes shoot curling. The leaf margins turn yellow to brown and the leaves eventually fall off. The population of SGL usually reaches its peak in the summer (Chen et al. 1978, pp. 96-97) and may cause great loss of tea shoots and leaves (Chen et al. 1978, pp. 93). Therefore, the SGL has traditionally been considered a serious pest for tea plantations. Many control methods, including chemical and biological control (Chen et al. 1978, p. 103; Shiau 2004, pp.7-8), have been developed to suppress populations of SGL and protect tea crops from pest damage. In the early 2000s, scientists of the Tea Research and Extension Station successfully developed a honey-flavored black tea processed from SGL-fed oolong tea shoots and leaves (Chen et al. 2004, pp. 81-87). This processing method was learned and further developed by a tea farmer of Wuhe, Mr. CS Kao, who outcompeted contestants from 25 countries and won the championship of the Black Tea Group in the First World Tea Contest held in Taipei in 2006. Ms. AD Nien, Kao’s sister-in-law, won four gold medals in the Black Tea Group of the International Tea Awards Competition held in 2010. As a result of these prizes and their media coverage, the honey-flavored black tea became very famous and popular and its price rose so high that the tea farmers of Wuhe no longer consider the SGL a pest but rather their economically important asset. Some, though not all, tea farmers stopped using pesticides, herbicides and chemical fertilizers and began using only organic fertilizers in order to keep a healthy population of the SGL in their tea farms to allow for production of more honey-flavored black tea. However, the effects of such EF versus CF practices on local biodiversity, as well as socio-economic impacts, have not been examined. To demonstrate, by scientific data, that eco-friendly farming practices and innovative technics adopted by tea farmers in Rueisuei Township of Hualien County not only generate higher economic return but also provide higher biodiversity and create more job opportunities for local people. The tea production landscape in Wuhe Tableland studied is near the Tropic of Cancer Monument in Rueisuei Township, Hualien County (Fig. 1). We chose six tea plantations of 0.6-1 ha as study sites for our biodiversity surveys (Appendix 1). These sites are surrounded by a mixture of secondary forest, betel nut and/or coffee plantations, streams, orchards, and human settlements (Fig. 1). Figure 1. Locations of study sites. See Appendix 1 for detailed information. Sites 1, 3, and 5 are tea plantations managed by EF practices. No herbicide or insecticide is applied, only organic fertilizer is used in these sites where weeds grow very fast and are controlled by frequent pulling and cutting (Fig. 2). The soil of these sites stays soft and moist in general. On the contrary, sites 2, 4 and 6 are managed by CF practices. Herbicide is applied on sites 4 and 6, where no or few weeds are observed and the ground always stays clean and compacted. The manager of site 2, however, uses betel nut leaves as mulch to reduce weed growth and herbicide is only applied to the ridges but not to furrows (Fig. 3). Managers of sites 2, 4 and 6 do spray insecticides, though they claim to only spray in spring and winter to control some caterpillars and mites and to always follow government regulations on pesticide application. In addition, chemical fertilizer and organic fertilizer were applied to sites 2 and 4. Chemical fertilizer was applied to site 6. Figure 2. Site 3 in March 2014. Note the weeds grow freely. Figure 3. Site 2 in March 2014. Note the betel nut leaves are used as mulch. We conducted field surveys to measure the diversity of insects, other arthropods and vertebrates (i.e., mammals, birds, reptiles, amphibians) once every season, i.e., in February-March, May, August and November, at six sites in 2014. Insects and other arthropods inhabiting different habitats, e.g., in the air, on the ground, in the soil or on tea plants, were surveyed by different methods. During each survey, one window trap (Toda and Kitching 1999, pp. 35-36) was set at the center of each site to intercept and collect flying insects, and four pitfall traps (top diameter 70 mm, height 80 mm, bottom diameter 50 mm, volume 200 ml) were set at least 15m apart to collect ground arthropods (Toda and Kitching 1999, pp. 43). Both types of traps were set for two days. Insects and arthropods that stay on tea plants were collected by beating methods (Toda and Kitching 1999, pp. 58), i.e., beating the tea plants with a stick 20 times while holding a collecting sheet under the area being beaten to collect fallen insects and arthropods. Four samples of beating were collected at each site. All insects and arthropods collected by the above three methods were stored in 80% ethanol and brought back to the laboratory for further examination. Soil insects and arthropods were collected by taking four soil cores (Toda and Kitching 1999, p. 49) per site. Collected insects and arthropods were extracted by a Tüllgren funnel (Toda and Kitching 1999, p. 46) for seven days. All insects and arthropods collected were counted and sorted under a dissecting microscope. Vertebrates were surveyed mainly by transect methods. The number and species of amphibians, reptiles and mammals sighted, heard, and whose tracks or signs were found, were recorded by walking along the border of each site. This transect survey was conducted twice a day per site, once during the day (from 0900 hr to 1500 hr) the other at night (from 1900 hr to 2300 hr), and was repeated for two days. Therefore, each site was surveyed four times in each season. The number and species of birds seen or heard in a 3m width band along the border transect were also recorded. However, the bird transect survey was conducted only once in the morning (within 4 hours after sunrise) at each site, and was repeated for two days. Therefore, each site was surveyed two times in each season. In addition, ten Sherman live traps were set with each at least ten rows of tea plants apart to capture small mammals such as rodents and shrews at each site. All traps were baited with sweet potato smeared with peanut butter for two consecutive trapping nights and checked the next morning of each night. Captured animals were released back to the field after being weighed and data recording. The number of species and individuals of small mammals trapped in each survey were combined with the number of mammal species and individuals recorded in the transect survey of the same season for data analysis. Tea farmers, including owners or managers of the six sites and key tea farmers in Wuhe of Rueisuei Township, foremen of laborers hired by these farmers, and the General Secretary of Rueisuei Farmers’ Association were interviewed to collect information on history, cultivation, production, and the ecological and socio-economic effects of EF and CF practices. Residual normality and homogeneity of variance were tested before further data analysis. Repeated measures ANOVA was applied to compare data collected from sites of two types of farming practices. However, the Kruskal-Wallis test was applied if data deviated from a normal distribution even after transformation, and the variances were not sufficiently homogeneous. A total of 56,987 arthropods (mainly insects) were collected during four seasons at six sites. More than 65% (37,228/56,987) of the total catch came from site 5. Due to the large number of specimens collected, only arthropod species collected in the first two seasons have been identified thus far. Identification of species collected in the remaining two seasons is still underway. The total number of insects and other arthropods collected at EF sites (41,793 individuals) is significantly greater than the number collected at CF sites (11,194 individuals) (H = 8.18, p < 0.005 for individuals). A total of 887 individuals of 56 species of vertebrates were recorded in this study. A significantly greater number of species and individuals (F = 70.14, p < 0.0001 for species, F= 43.25, p < 0.0001 for individuals) was recorded at EF sites compared to CF sites. In addition, at least five legally protected species listed in the National Wildlife Conservation Act, i.e. the ring-necked pheasant (Phasianus colchicus), the brown shrike (Lanius cristatus), the Styan’s bulbul (Pycnonotus taivanus), the Chinese cobra (Naja atra) and the many-banded krait (Bungarus multicinctus), were found in EF sites. Based on the results of stakeholder interviews, the area of tea plantations in Wuhe reached 200 hectares in the 1960s, then dropped to less than 100 hectares before the invention of honey-flavored black tea about 10 years ago. Now the total area of tea plantations in Wuhe is about 100 hectares, and at least 60% of the plantations are now cultivated by EF practices. 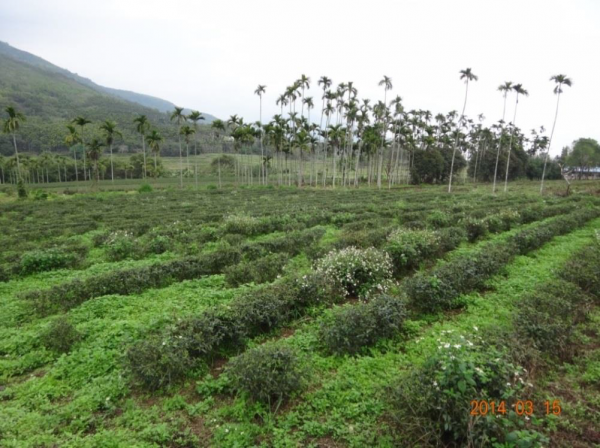 The remaining tea plantations are managed for the most part innocuously, i.e., pesticides are applied at a minimum and according to government regulations on pesticide application. Although tea farmers practicing EF saved 1,700-2,000 USD per hectare per year on the cost of pesticides and herbicides, this amount is scarcely comparable to the cost of extra labor required for EF practices (see below). However, EF practices brought social benefits to local laborers. In the past, tea leaves were mainly plucked in spring and winter when insect damage was minor, and tea plucking laborers (mostly indigenous women and some foreign spouses) typically worked only 50 to 60 days a year. With the invention of honey-flavored black tea, tea leaves can be collected almost year round to produce various types and qualities of tea (see below). In addition, because weeds are cut or pulled manually once every 2-4 weeks depending on how fast grasses grow at an EF tea plantation, more laborers are needed. Due to the extra work of weeding and longer seasons of tea plucking, laborers hired by tea growers of EF tea farms now work more than 300 days per year, which means getting 5 to 6 times more income a year than before. Although labor is costly (33-66 USD per day per person), the honey-flavored tea produced by EF practices sells so well that the income of tea growers has increased 2-5 times compared to 10 years ago. The price of honey-flavored black tea ranges from 60 to 120 USD per 600 gm, depending on the quality of the tea produced. Premium tea is sold as high as 400 USD per 600 gm. Tea growers now do not worry about hiring more laborers, using the more expensive organic fertilizer, or the loss in quantity caused by SGL damage because this extra cost and loss can always be compensated by the increase in unit price of various types of tea. In fact, feeding by SGLs is no longer considered to be “damage’’, but “benefit.” As the population of SGL decreases, tea shoots and leaves are less damaged and can still be processed into some other tea products, e.g. oolong tea, which is sold at regular or lower price. Therefore, tea plantations are managed to ensure that the SGL can feed on tea shoots and leaves. Timely weeding forces the SGL to feed on tea shoots and young leaves. The grass regrows within several days after weeding and the SGL may return to this shelter. Results of the interview also showed that the Farmers’ Association is the most important institution to tea growers, and the Tea Research and Extension Station (TRES) is the key institution for training and extension. There are about 50 tea growers in the Rueisuei Farmers’ Association. However, farmers who are more actively practicing EF are in general younger farmers. Farmers do share and exchange knowledge and skills on tea growing through the arrangements of the Farmers’ Association. However, there is much know-how in terms of making teas, and tea growers seldom talk about how they make their own teas. Nearly 100 laborers were hired by tea growers in Wuhe in 2014. Like other rural areas in Taiwan, Rueisuei is also facing the threat of aging as the average age of the laborers is about 55. Most of the younger generation has moved to urban areas, though there are a few who either stayed or returned from urban areas and joined the tea farming business in recent years. Gender inequality is not a big issue in Wuhe, i.e. women have equal rights in terms of voting and being voted in, working, education, property ownership, etc. A woman was newly elected as Leader of the Tea Production and Marketing Group of the Rueisuei Farmers’ Association. Our results showed that tea plantations with EF practices not only generate higher economic return but also conserve higher biodiversity. In addition, more job opportunities were created through the EF practices. We conclude that social interviews and stakeholder engagement as well as a biodiversity survey are not only useful but also critical tools to identify and verify a socio-ecological production landscape (SEPL) such as the tea production landscape in Wuhe Tableland. Demonstration of how an innovative way in wise-use of biodiversity can provide incentive to farmers in applying EF farming practice and bring socio-economic and environmental benefits, e.g. a tea production system where eco-friendly farming (EF) is practiced to keep small green leafhopper (SGL) population so that SGL-fed tea shoots and leaves can be made into high-priced honey-flavoured black tea. Biodiversity survey demonstrated that EF tea plantation had higher biodiversity than conventional tea plantation. Socio-economic survey demonstrated that EF practices brought higher economic benefits and social benefits such as increased employment. The innovative tea production is applied by 2/3 of the total tea plantations in the district and is now applied in other parts of the Taiwan island. Few ecological studies examine how eco-friendly farming practices have affected the biodiversity in any given area. It is critical to have quantitative assessment on biodiversity to clarify the impact of such efforts on the biodiversity of a SEPL. Policy of local government plays a significant pivotal role in guiding eco-friendly farming. The Hualien County Government encouraged and subsidized farmers practicing innocuous agriculture. The County Government also helped marketing the innocuous agriculture product. In light of this case study, it should be noted that farmers could avail themselves of the opportunity to engage in eco-friendly agriculture. Innovation is important to enhance the agricultural production as well as resilience of SEPL to deal with unpredictable changes in the future such as climate and market. The Taiwan Tea Research and Extension Station, or TRES, helped tea farmers develop new and better cultivars, improve management of tea plantations and tea processing, improve roasting skills and marketing, which may help promote EF practices. The authors would like to thank the Satoyama Development Mechanism (SDM) for funding support and the Taiwan Forestry Research Institute, Biodiversity Research Center of National Taiwan University for in-kind support. The authors would like to thank Akane Minohara, Robert Blasiak and Amanda Wheatley for their comments and suggestions on an earlier draft of this paper. Thanks also go to Hsi-Cheng Ho, Ming-Yu Tsai, Tsung-Yi Lin, Wen-Chi Yeh, Fu-Tun Hsu, Yun-Yun Lee for their assistance in lab and field work, and data analysis. Last but not the least, we are grateful to tea farmers of Wuhe Tableland, particularly A-Duan Nien (owner/manager of sites 1, 3, and 5), Mr. and Mrs. Chao-Yi Lee (owner/manager of site 2), Shien-Chao Wang and Fu-Chun Liu (owner and manager of site 4), as well as Wu-Hsiung Huang (owner/manager of site 6) for allowing us to study their tea farms and providing social and economic information during interviews. Additional socio-economic information provided by Ching-Ho Wei (Director of Rueisuei Farmers’ Association), Yi-Cheng Hsu, Yue-Mei Chen (deceased) and many others are also appreciated. The study was funded by Satoyama Development Mechanism (SDM) 2013 Selected Project and the in-kind support of the Taiwan Forestry Research Institute and Biodiversity Research Center of National Taiwan University. Chao JT & Lee LL. 2015. Chapter 11. 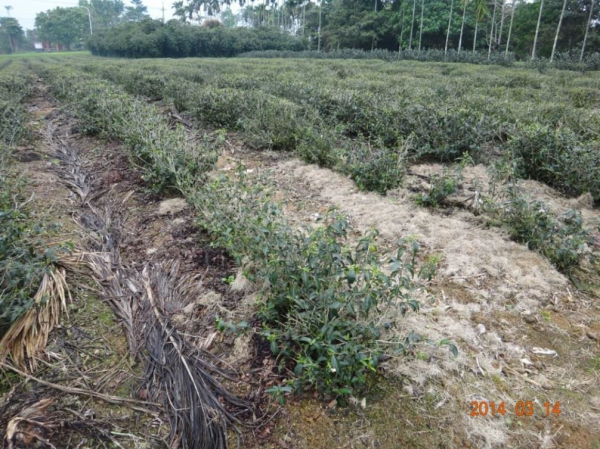 Converting pests into allies in tea farming – a SEPL case in Hualien, Taiwan. pp. 90-95. In UNU-IAS and IGES (eds.) 2015, Enhancing knowledge for better management of socio-ecological production landscapes and seascapes (SEPLS) (Satoyama Initiative Thematic Review vol.1), United Nations University Institute for the Advanced Study of Sustainability, Tokyo. Toda, M & Kitching, RL (eds) 1999, IBOY-DIWPA: Biodiversity assessment program in the Western Pacific and Asian region. Forest ecosystems: the assessment of plant and animal biodiversity in forest ecosystems. Vol. 2, pp. 1-95.